This article covers how to connect Ubidots to Arduino to build an IoT project. Moreover, during this practical guide covers how to connect Arduino and Android so that an Android app can read data stored by Arduino into the IoT cloud platform. This aspect is important because it is possible to store data in the cloud and analyze it later using different means. Once the data, like sensor values, is in the cloud is possible to access it using smartphones. This Arduino and Android integration project demonstrates how easy is connecting Arduino and Android together implementing an IoT system. This IoT project can have several implementations and it can be really useful in real life IoT project. Usually, the integration between the mobile and the IoT ecosystem is a quite common scenario. 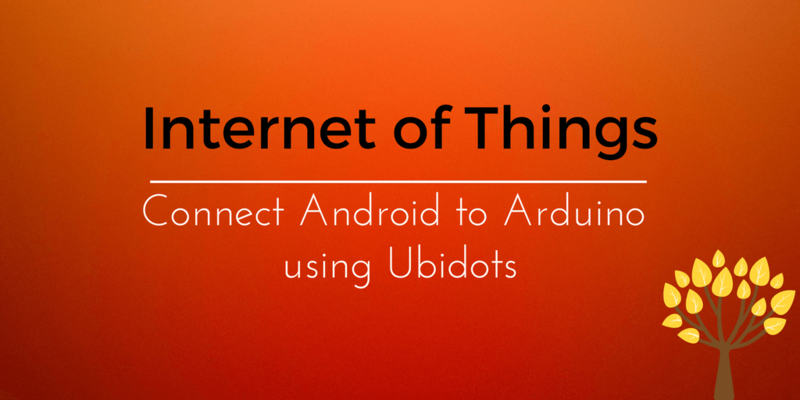 In this tutorial, we want to cover how to use Ubidots with Arduino and next how to integrate Arduino and Android so that an Android app can interact with Arduino and reads the sensor’s data. the second part describes how to access this information using an Android smartphone. For this purpose, the data is generated by a DHT11 sensor, that reads temperature and humidity. As cloud IoT platform to store data, we will use Ubidots platform. 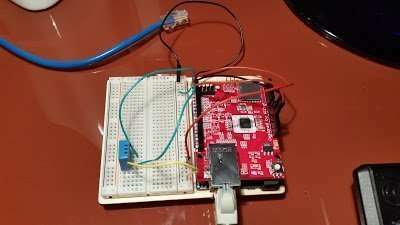 The sensor is connected to Arduino board that uses a Ethernet shield to connect to the network. In this project, the ethernet shield is Wiznet 5500. As soon as the temperature and humidity sensor starts reading values, it sends them through Arduino board to the cloud platform. The project uses Ubidots to store data in the cloud. This platform is easy to use and can be easily integrated with Arduino. Moreover, it has a built-in dashboard features, so that it is possible to create interesting dashboard to show, using charts, the values sent from the board. One thing to remember is importing DHT11 library in your Arduino IDE. Running the example you should get the temperature and the humidity. If everything works correctly, it is time to make things a little more complex explaining how to use Ubidots with Arduino. As stated before, the purpose of this first part of this IoT project is describing how to use Ubidots to Arduino so that values read by sensors connected to Arduino are sent the the cloud. 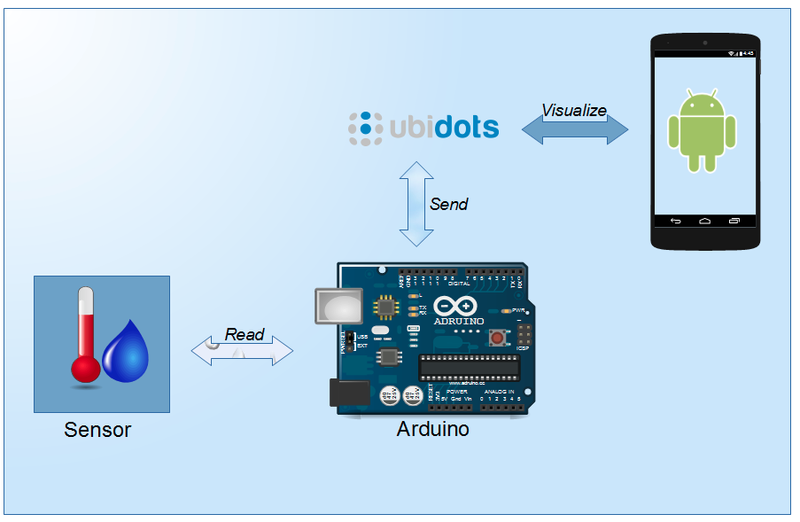 In a second step, this IoT practical guide covers how to develop an Android app that reads data stored in Ubidots. Ubidots provides an example that can be useful. In Arduino, we have to develop an Arduino HTTP client that calls a JSON service passing the data we want to store in the cloud. Referring to the Ubidots documentation, it is necessary to create an authentication token that the client has to send. Please read below to know more how to create the token. Notice at line 65 and 66 we build the JSON data to pass to the service using the variable ids (please refer below to know how to get the id) and at line 83 we send in the header the authentication token. The Arduino HTTP client for Ubidots is almost ready, it is time to configure the project in Ubidots. 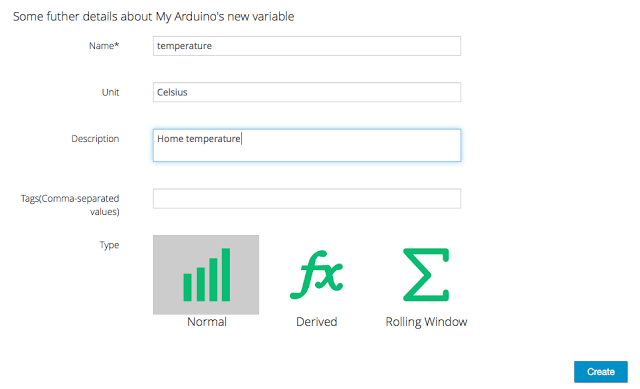 Now, it is necessary to configure the project on Ubidots so that the Arduino client can send data. It is possible to configure the project using Ubidots web interface. one that holds humidity values. As you can see, these two variable have two ids that we used previously when we created the JSON request. Once the variables are configured we can use them to send data. Running the sketch, Arduino starts sending data to Ubidots. One feature provided by Ubidots is the capability to create a dashboard in an easy way. Below the real Arduino board connected to DHT11 with Ethernet shield. The next step in this Arduino and Android integration project is explaining how to create an Android app that connects to Arduino. Even if Ubidots provides a client to handle REST requests, it didn’t satisfy me so i prefer to develop a custom client based on OkHttp library. The class that handles the HTTP request is named UbidotsClient. The client uses an authentication token to authenticate the app to exchange data and variable ids to select the variable to read. If you remember, we talked about these two items in the previous post. At line 2, the Android app adds the authentication token to the HTTP request header. At line 3, the app calls the service provided by Ubidots passing the variable id we want to read values. Finally, at line 5, the app makes the HTTP request and wait for the response. One interesting aspect of OkHTTP client is that it handles requests in a separate thread so we don’t have to worry about ANR problems. When the android app invokes a remote services using REST, as Ubidots services, it gets a JSON response that has to be parsed so that it is possible to extract information. The Ubidots response is very easy and it is made by a JSON array and each item contains two values: the variable value itself and the timestamp. Finally, at line 17 the parser notifies the result to the main class so that it draws the chart. In this snippet, the app creates LineDataSet that is used to draw the values. The same steps are applied to draw humidity chart. 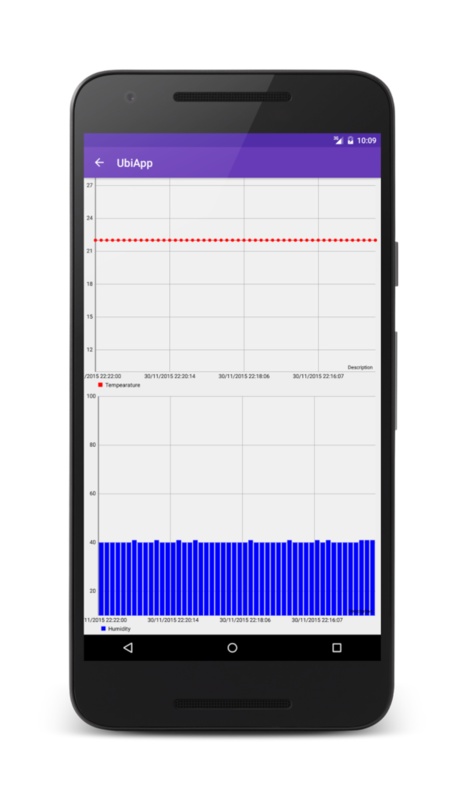 At the end of this post, you learned how to use Ubidots with Arduino and how to retrieve data from Ubidots using Android app. 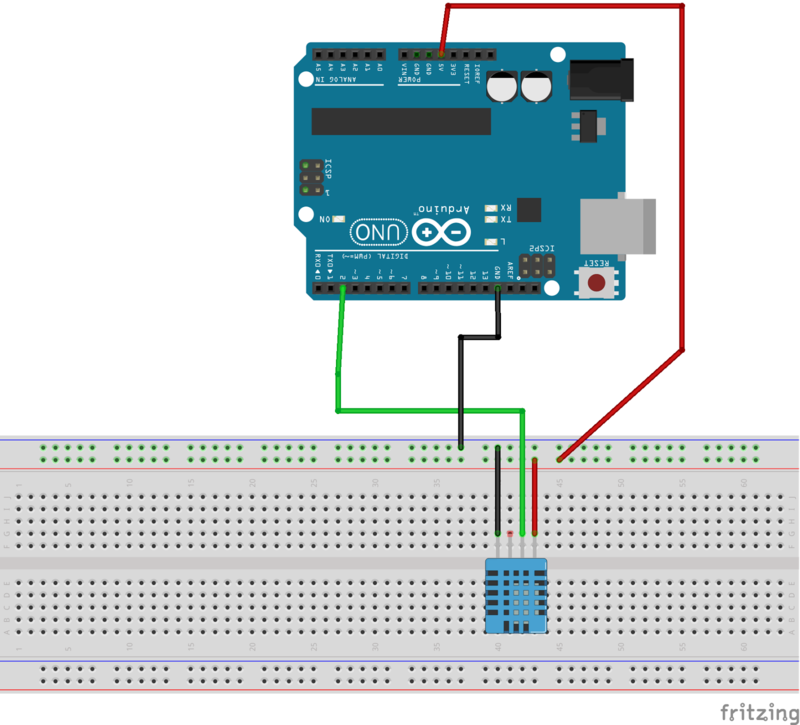 In the end, we have described how to connect Arduino and Android through Ubidots and how to write Android app that retries sensor data coming from Arduino. Thank you for your detailed description! But when i tried doing, my data doesn’t reach the ubidots. Why is this? The arduino code has no errors and one doubt of mine is that you have mentioned about creating a project in ubidots. Bt I coudn’t see any such options and instead i created a Device nd then added the variables to it and created dashboard also.Are both the same? Also, for testing I passed values to float t and float h ,(the variables.) I commented all the DHT portions and its library. The code as such is working but the data is not being transmitted. Can You help me out? Yes the steps are correct. You can check on Ubidtos side if the data is present. Try to check if you can invoke the url or there are some hidden errors that you do not show.